More 1 star chefs. More American chefs. More Korean chefs. 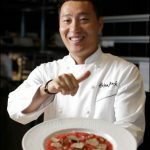 Born in Korea and raised in Aspen, Colorado, Chef Back brings a sense of adventure and boundless creativity to his culinary creations. 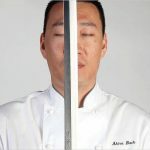 From extreme sports athlete to award-winning chef, Akira Back’s journey to culinary success has been anything but dull. 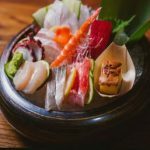 Using only the high-quality ingredients and creating a culture of world-class service in a welcoming environment, Chef Back’s restaurants embody classic Japanese cuisine and always feature innovative dishes that use the freshest ingredients from the world’s top purveyors. Before taking his turn in the kit chen, Back spent his early years as a professional snowboarder in Colorado, appearing in extreme movies and garnering praise from the sport’s top trade publications. During this time, Back began working at local restaurants to supplement his income as an extreme sports athlete. After seven years on the pro-snowboarding circuit, he realized that he felt the same thrill in the kitchen as he did on his board, shaping his decision to pursue a full-time culinary career. Then, Back went on to study at the International Culinary School at The Art Institute in Colorado. In 1993, he began working at Kenichi in Aspen as Sushi Prep Cook and was later recruited to Kenichi in Austin, Texas. Then in Kona, Hawaii, where he worked as the Opening Chef. Combining his passions for adventure, travel and culinary exploration, he toured extensively throughout Japan and Europe. 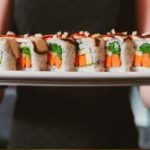 On top, he has been studying under top celebrity chefs and industry leaders, including Masaharu Morimoto and Brian Nagao. It was during this period that he learned the value of using rare and exotic ingredients. In 2003, Back returned to Aspen to lead the kitchen as Executive Chef of Nobu Matsuhisa’s name sake restaurant. 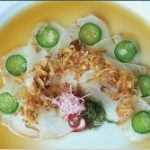 In the Fall of 2017, the 2018 Seoul Michelin Guide Seoul awarded Chef Back. Indeed his famed restaurant DOSA received one Michelin Star for its excellence in innovative cuisine and service. This is one of the highest accolades a chef can receive and true honor for the South Korea native. Also he has been awarded the title of “Rising Star” by Restaurant Hospitality (2008). Next to it, he has had the distinct honor of hosting the prestigious James Beard House dinners (2008, 2010, 2011 and 2012). Since opening Yellowtail Restaurant & Lounge in 2008, he has been named “Best Chef in Las Vegas” by Las Vegas Weekly. In addition to these top accolades, Back has had extensive broadcast experience. Indeed, he has been appearing on Food Network’s “Iron Chef America,” where he battled Iron Chef Bobby Flay. Back can also be seen on NBC’s “The Today Show”. Also on Food Network’s “Best Thing I Ever Ate,” The Cooking Channel’s “United Tastes of America,” as well as KBS’ “Success Mentor” which airs in Korea. Chef Akira also developed his own concept in 11 venues all over the world. From the US to Dubai, Singapore, Bangkok, Hanoi, Seoul, Jakarta or Dehli! More 1 star chefs here. More Korean chefs. Other American chefs here. Go back home.